Sinclair, Ross and et, al. 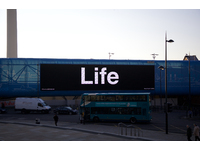 Four Words, a series of animations on the The Media Wall outside Lime Street Station, Liverpool. "It is January 2016, the sales season, and the public are being coaxed back onto the shopping treadmill. 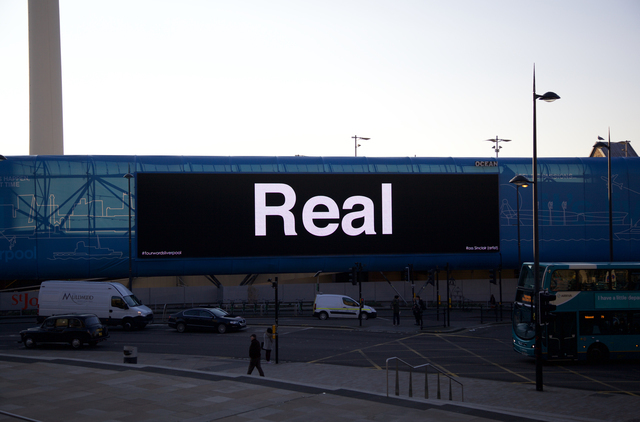 We want to offer the Liverpool public FOUR WORDS that will act as a counterpoint to the sales season and the invisible pressures of this time of year, with ruminations on value, money and exchange. 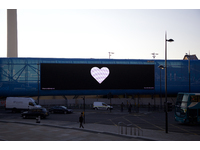 We have hired the 31x7m Media Wall opposite Lime St to present a total of 120 ten-second FOUR WORDS animations we have developed with artists, writers, retired seafarers, gardeners, activists, local workers and school groups." 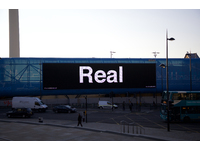 The Media Wall outside Lime Street Station will host an alternative stream of provocative, 10 second animations of just four words, between 3pm and 4pm on 20th January. Over 70 participants from a range of backgrounds were given the task of writing a four word statement. 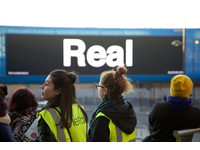 The contributors include Gerhard Richter, Douglas Coupland, Pavel Büchler, Fiona Banner, Levitt & Dubner (‘Freakonomics’), David Shrigley, Ross Sinclair and Hala Al-Alaiwat, amongst others. Each set of FOUR WORDS will act as a counterpoint to the sales season and the invisible pressures of this time of year, with ruminations on value, money and exchange. 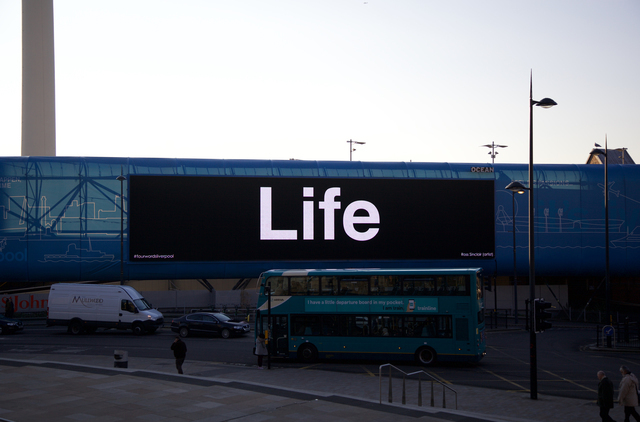 Four Words, part of Metal's Liverpool Provocations programme, saw a giant electronic billboard in the city centre taken over for an hour by a series of animated four-word messages and slogans curated by artist Alan Dunn. 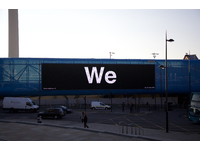 You can say a lot with four words and on the afternoon of Wednesday 20 January 2016 between 3-4pm, a lot was said via an electronic billboard in Liverpool city centre. 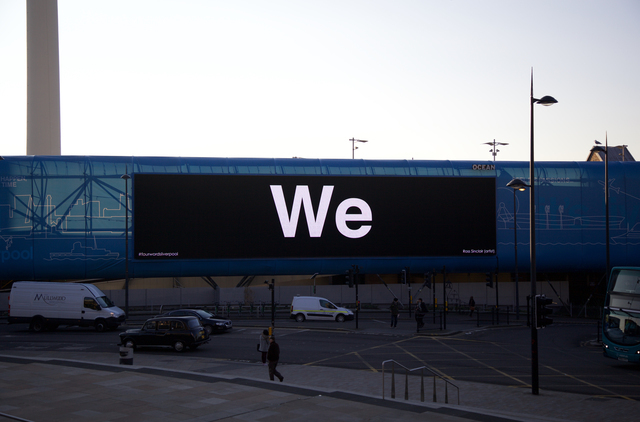 Situated opposite the entrance to Lime Street Station and usually used for advertising, for one hour it was taken over by curator and artist Alan Dunn for the Four Words project, part of Metal‘s Liverpool Provocations programme, which continues until Saturday. 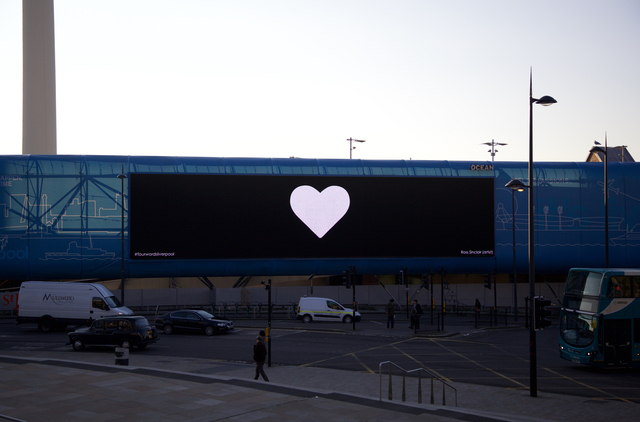 Billed as ‘a series of interruptions’, the billboard – Europe’s biggest, full-motion digital advertising screen – featured the animated work of 108 individuals and included contributions from non-artists as well as internationally recognised names. 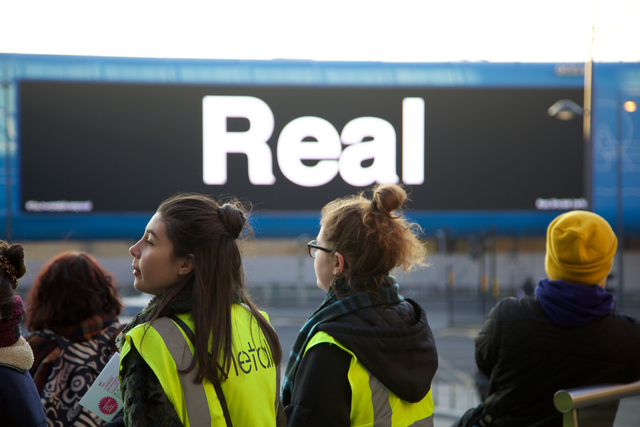 Snappy, slyly subversive and sometimes thought-provoking announcements and calls to action flickered like unexpected interruptions to afternoon shopping trips. See the video below for more. ‘People respond to incentives’ announce Freakonomics – economist Steven D Levitt and writer Stephen J Dubner – a cheekily provocative statement in the midst of the January sales.